River ravenous and featuring driftboat loads of appreciated comfort, Simms’ Women’s Solarflex™ Hoody blazes into spring with savvy UPF50 protection now in prints along the inside of the arms and sides. Powered by COR3™ fabric tech, this hardworking piece wicks moisture and neutralizes unwanted odors at the source. In addition, angler-appreciated architecture starts with plush flat seam construction and finishes with a longer body for full coverage when rowing. 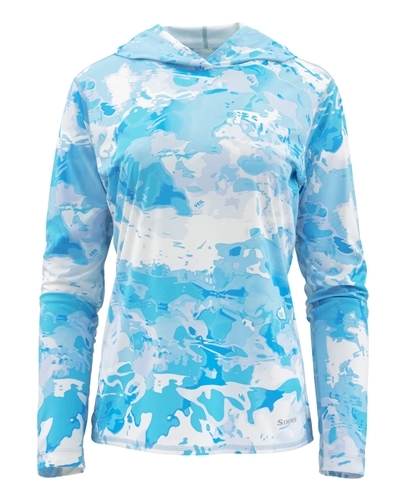 This Simms Women's Solarflex Hoody - Print is extremely comfortable to wear and I really like the look of it too. It is the perfect women's solarflex hoody and is made by Simms, so you know that it is quality made, so highly recommended by me.